Description: Comes in a cardboard box, with a stand for the 3DS. Also includes 6 random AR cards. 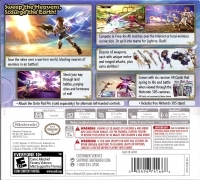 Box Text: Sweep the Heavens, Scourge the Earth! Soar the skies over a war-torn world, blasting swarms of enemies in air battles! Shoot your way through land battles, purging cities and fortresses of evil! Compete in Free-for-All matches over the Internet or local-wireless connection. Or split into teams for Light vs. Dark! Dozens of weapons, each with unique melee and ranged attacks, plus extra abilities! Comes with six random AR Cards that spring to life and battle when viewed through the Nintendo 3DS cameras. Attach the Circle Pad Pro (sold separately) for alternate left-handed controls. Includes free Nintendo 3DS stand. 11-10-2015 silverbow Box Text Sweep the Heavens, Scourge the Earth! Soar the skies over a war-torn world, blasting swarms of enemies in air battles! Shoot your way through land battles, purging cities and fortresses of evil! Compete in Free-for-All matches over the Internet or local-wireless connection. Or split into teams for Light vs. Dark! Dozens of weapons, each with unique melee and ranged attacks, plus extra abilities! Comes with six random AR Cards that spring to life and battle when viewed through the Nintendo 3DS cameras. Attach the Circle Pad Pro (sold separately) for alternate left-handed controls. Includes free Nintendo 3DS stand. 03-24-2012 scott Description Comes in a cardboard box, with a stand for the 3DS. Also includes 6 random AR cards. 03-24-2012 scott Box Text Sweep the Heavens, Scourge the Earth! Soar the skies over a war-torn world, blasting swarms of enemies in air battles! Shoot your way through land battles, purging cities and fortresses of evil! Compete in Free-for-All matches over the Internet or local-wireless connection. Or split into teams for Light vs. Dark! Dozens of weapons, each with unique melee and ranged attacks, plus extra abilities! Comes with six random AR Cards that spring to life and battle when viewed through the Nintendo 3DS cameras. Attach the Circle Pad Pro (sold separately) for alternate left-handed controls. Includes free Nintendo 3DS stand. This is a list of VGCollect users who have Kid Icarus: Uprising in their Collection. 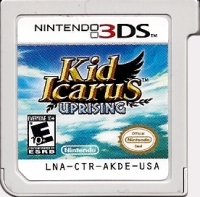 This is a list of VGCollect users who have Kid Icarus: Uprising in their Sell List. 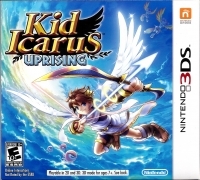 This is a list of VGCollect users who have Kid Icarus: Uprising in their Wish List.